I’ve been feeling a bit blue this April, a time of year when we often go on some kind of family adventure, but it’s not in the cards for this year. So my husband suggested a consolation prize: a plant-buying expedition at the New England Wildflower Society. The Garden in the Woods only opened on April 14, and I wasn’t sure if we’d find many plants for sale, but we did! To be sure, they were light on the shrubs which are still mostly bare twigs and therefore not very attractive to potential buyers. On the other hand, there were many beautiful small plants and early wildflowers that are inspiring at this time of year. I love going to NEWFS at different times of the year, and being able to see both a different selection and different phases of familiar plants. You can tell how good my experience with their plants have been – I bought two “plants” that actually haven’t emerged. We joked that they could have a great business just selling potting soil with plant labels (not really). Two more bearberry (Arctostaphylos uva-ursi ‘Massachusetts’) plants, another one for the front sloping bed, where I hope to start taking out the Stella D’Oro lillies, and one to try on the deck. 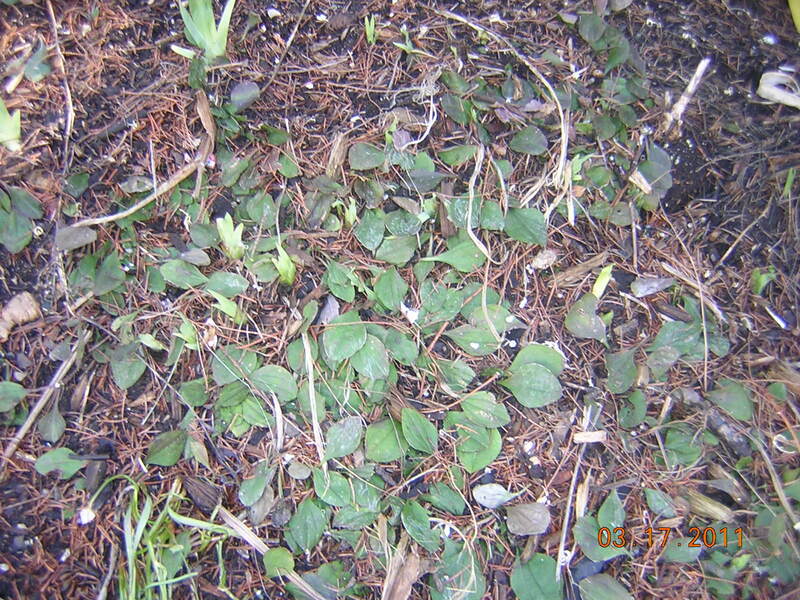 This is obvious – why haven’t I planted bearberry on the deck so far? It is perfectly suited to the deck conditions, and should be a fantastic addition year-round. It does mean I have to move around some plants to make room for it (but that’s one of my favorite pastimes). Mayapple (Podophyllum peltatum) for the shady bed under the kiwi vine and dogwood tree in the side garden. The NEWFS staff warned me this may be a bit of a thug, and this is an area that needs kind of a thuggy shade loving plant, even the heuchera have been slow here, and it is bounded on all sides by the stone wall, brick path or lumber steps. Trailing Arbutus (epigaea repens). This is the Massachusetts state flower, and I’ve never even heard of it! Canadian windflower (Anemone canadensis L.). 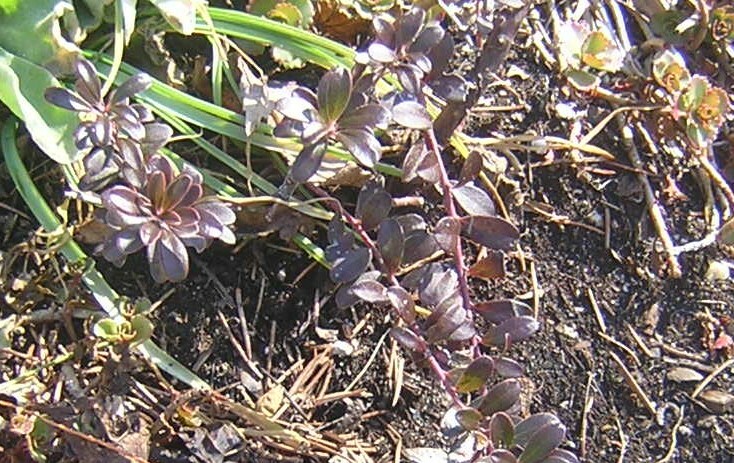 This is another shade-loving plant with a reputation for being aggressive. I’m planning to put it in the dogleg with the Mayapple, and under the dwarf plum on the deck (in a container). I’m hoping it will help to fill in these areas. Next up: Dog Hobble (Leocothoe fontanesiana). The commercial landscaper working on our fence border said he’d seen problems with disease with this plant, but it’s done well for me ever since August, 2009. It hasn’t yet covered our foundation, and I look forward to it doing so. What a great alternative to big box evergreen shrubs. This is Parlin’s Pussytoes (Antennaria parlinii ssp. fallax). It is not supposed to be evergreen, but it seems to have come through this winter with hardly any leaf loss. I first bought this as an erosion-control ground cover to replace the invasive Creeping Jenny I found when I got this. I wasn’t crazy about its looks, but the longer I have it, the more I like it. Its relatively large leaves cover the ground in green, and it spreads nicely, yet is well behaved, moving around other plants and easy to dig up when necessary. As you can see, I have it in among irises (a family request), that would otherwise leave this area bare this time of year. 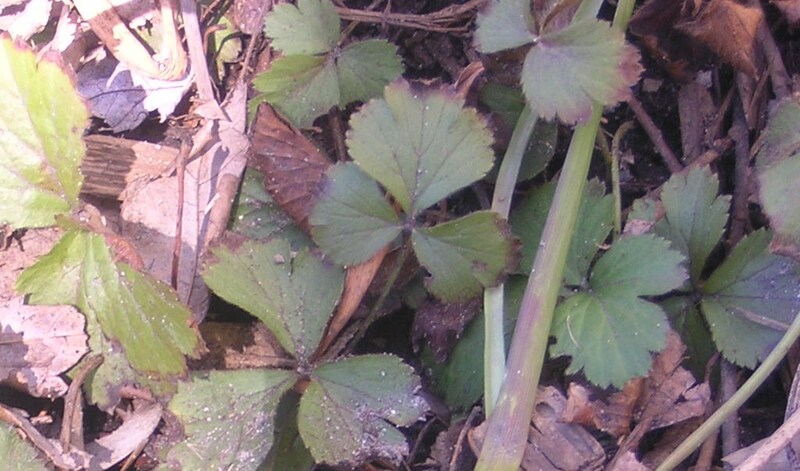 Barren Strawberry (Waldsteinia fragarioides) is advertised as an evergreen and its leaves do stay green and glossy through the New England winter. You can see that they also sustain some winter damage. On the other hand, the debris you can see on these leaves is from sanded snow shoveled on top of this bed over the winter – in these circumstances, perhaps we should be impressed by how little damage it sustained. 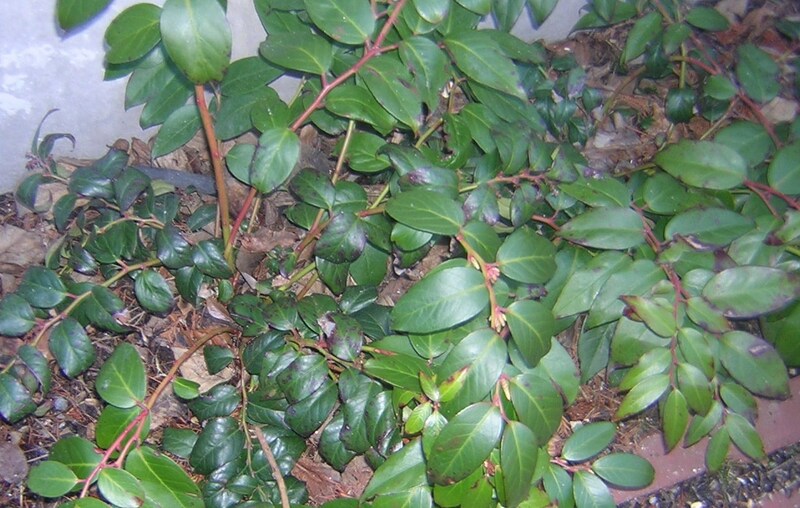 One other plant worth mentioning: Bearberry (Arctostaphylos uva-ursi). This one turned such a deep bronze red over the winter it doesn’t jump out, but it is nonetheless an elegant survivor. I have this in a tough place, on a sloping corner where it is often stepped on or run over by trash barrels. I am going to try another plant in a more hospitable spot in this area. Mr. Smarty Plants Answered My Question! Now you know I’m a gardening geek…really, getting the response made my day :-). So, who, you might ask, is Mr. Smarty Plants? Actually, it’s not one person, it’s several people who all answer questions about native plants sent in to the Lady Bird Johnson Wildflower Center’s Native Plant Information Network. I was looking for a recommendation about a ground cover that could withstand the heavy rainfall right next to the west wall of our townhouse. See the full question and response here. Unfortunately, Mr. Smarty Plant’s answer was essentially, that’s a tough question. 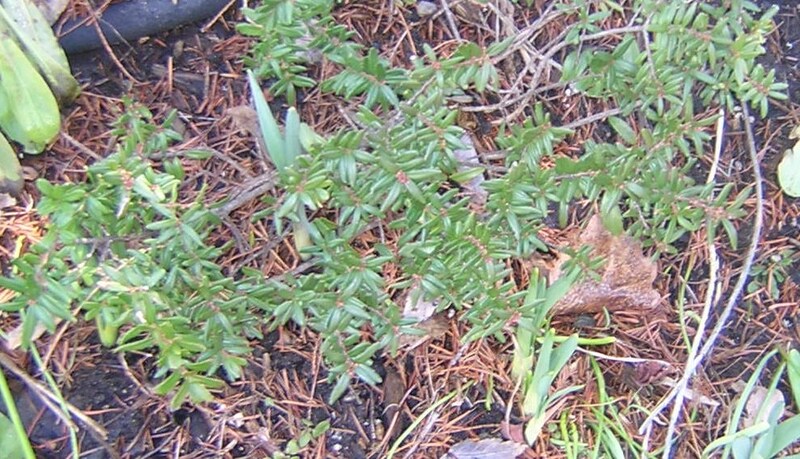 They did suggest several shade-tolerant ground covers native to Massachusetts, and I was pleased to note that I have several of them already, but I don’t think most will work in these conditions. Asarum canadense (Canadian wildginger) is much slower to grow and spread than the European ginger and I’m not sure I could get it established in this spot; I love both Gaultheria procumbens (eastern teaberry) and Cornus canadensis (bunchberry dogwood) but have yet to have either of them survive and thrive again after a winter; Mitchella repens (partridgeberry) is kind of fragile, I think, and needs to be mostly undisturbed. It grows in deep shade under my Weeping Alaskan Cedars, which I love, but I doubt I could get it established with the kind of hard rainfall that this area gets. I haven’t tried Fragaria vesca (woodland strawberry) and perhaps I should, or Barren Strawberry? That’s done well in a few areas of my garden. The best suggestion, I think, is sedum, which I could grow elsewhere and then move over as a mat. I’ve got a couple of sedums growing elsewhere in difficult spots, but I don’t know if I can identify the specific kind of sedum, or find this one: Sedum ternatum (woodland stonecrop) in a nursery around here. I may go with a succession planting scheme, starting with some fast-growing and tough non-natives, to hold the erosion at bay, and then start to move in a native ground cover. Posted on June 26, 2010 July 6, 2010 Categories dogleg garden (west-facing, shade)Tags ground cover, Mr. Smarty Plants, native plants, rain gardensLeave a comment on Mr. Smarty Plants Answered My Question!